I still trying to figure out the best way to capture falling snow with the camera. The large snowflakes are so impressive in person but the still image never seems to convey the natural beauty of winter in the same way. That is a lovely photo. I would probably take Photoshop to it. would that be cheating? That is so beautiful! Truly a winter wonderland! I'm with you - I always have a hard time, too. But I think you did an exceptional job of capturing it in this image. Very beautiful!! I think you did splendidly. A beautiful scene! I think you did an excellent job capturing the beauty of snow falling. Great photo! I really like it! It's BEAUTIFUL!!!! I think you did a good job capturing the beauty. I'm with you...I never know how to capture the beauty. Your photo looks lovely regardless. We haven't had very much snow this year compared to last year. I live in Omaha, NE, and we usually get more snow then I'd like. I love your photo! You will have to read Snowflake Bentley for sure! 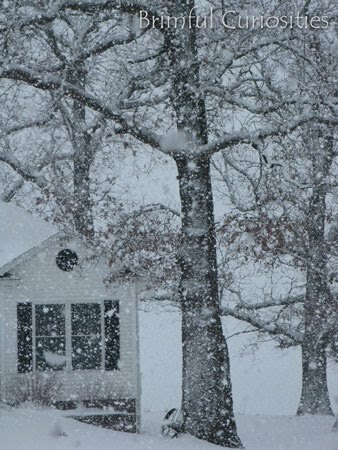 It was snowing here on Christmas day (not much) and I sent my husband out with the video camera to capture it. When I played it back later you can't even tell that it's snowing :( I was so disappointed. Oh well. The snow's supposed to hit us this weekend and then I probably can't wait until spring! That's a gorgeous photo of snow falling. I love it! Those look like the sort of snowflakes that inspire kids (and sometimes their grown-ups!) to try to catch snowflakes on their tongues. What a magical part of winter.